Every knife needs to restore its factory sharpness once it gets dull. Whether it’s manually sharpened by a skillful man or using the best electric knife sharpener, it’s a matter of personal choice. Can we continue to cut food with a dull knife knowing that it’ll easily slip and cut the fingers anytime? To save the fingers, the obvious answer is NO. “A sharp knife is a safe knife”, the chef told me. Let’s get all the knives sharpened quickly, upkeep first-class kitchen efficiency and make delicious food. A lot of people agreed that expensive knives require the professional sharpening services. But it’s expensive and time-consuming. Or an experienced and skillful person can also get it done at home with expensive whetstones and sharpening toolkits. Let’s get real, an average Joe or busy mom may not have the time or interest to master first-class sharpening skills. In addition, you’ll need some practices to achieve good results. If you’ve already mastered it, please continue to do so. You’re doing yourself a favor. What if I want a quick and foolproof method in a comfort of my home? Let’s move together with technology. The electric knife sharpener will restore knives to razor sharpness in a minute or two maximum. Professional chefs recommended electric sharpener due to the speedy results and ease of use. Your one-time investment will pay back many times over. Electric knife sharpeners have been in the market for many years and keep evolving. Brands like Chef’s Choice, Work Sharp, Presto, and Linkyo have hundreds and thousands of positive reviews. We know you are in good hands. We’ve compiled the top-rated and best electric knife sharpeners to ease your life in the comfort of your home. This is among the most affordable knife sharpeners manufactured by National Presto Industries, Inc. 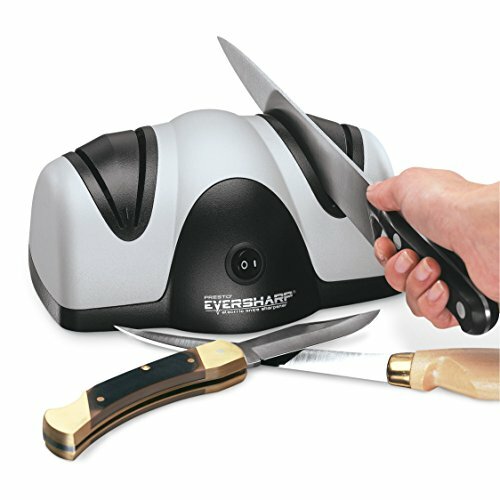 The Presto 08800 EverSharp Electric Knife Sharpener is a 2-stage sharpener designed for kitchen and sporting knives made from carbon, alloy, or stainless steel. However, serrated blades are not recommended unless you want to sharpen on only one side of the blade. This model uses Sapphirite sharpening wheels which is quite impressive what it offers for the cost. The Sapphirite material is only used in professional sharpening shops. Obviously, this is the best selling point when it comes to low budget as compared to high-end sharpener. Stage 1 is for 20 degrees precision grinding and stage 2 is to polish and hone the edge. Despite it’s a low budget, entry-level electric sharpener, it can turn dull knives into razor-sharp edges in one minute. The three suction cups on the bottom ensure it holds the sharpener firmly to avoid slipping during the sharpening process. Two receptacles are located underneath to store the metal filing and it can be easily disposed of. The sleek and modern design can easily blend right in most of the kitchen designs. Users are impressed by its quiet operation. Read full review on Presto 08800 EverSharp Electric Knife Sharpener. The best thing we liked about this electric sharpener was its elegant style and design at such an affordable price! Also, Sapphirite sharpening wheels are one of the major factors why we recommended it. The Linkyo sharpener is a 2-stage knife sharpening system that focuses on quality and speed. The first stage reshapes the angle while the second stage hones and polishes the blade. Linkyo comes with automatic blade positioning guides. Sharpening process is a breeze while the guides will accurately position the blade for you, making sure the knife stays in place at all times. It takes the guesswork out of sharpening, even for a beginner. There’s no need to apply downward pressure during the sharpening process. Just in case you’ve accidentally applied too much pressure, the sharpener will stall to avoid damaging the blade. Thanks to the built-in “Stop” feature that is designed for beginner and even experienced users. You’re pretty sure it will not damage your knives. Clearing the metal shards and filings is easy. It comes with receptacles to gather filings after each use. The frequency of the clean-up will depend on how often you use the sharpener. You do not need to empty it every time after each use. We suggest a periodic maintenance is good enough (every three months). With safety feature built-in to ensure it‘s rock solid and does not slip, the heavy-duty suction cups on the bottom will ensure it stays in place during use. This sharpener is good for sharpening straight-edge knives but lack behind for serrated blades. Overall, it’s a reliable and affordable electric knife sharpener. 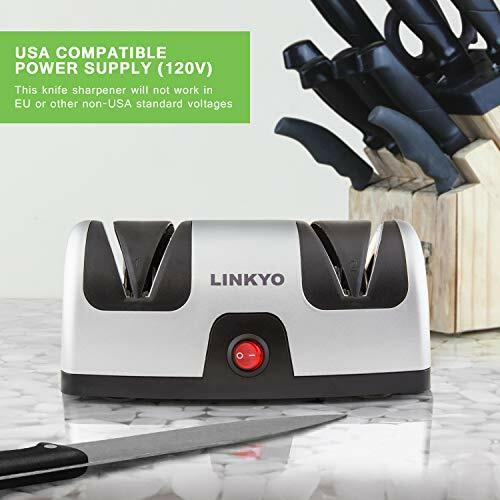 Read full review on Linkyo Electric Knife Sharpener. The best thing we liked about this electric sharpener was that it is simple to use and works on almost all types of knives and gives them a new look every time. A lot of people hope to have the best of both worlds. The Chef’s Choice 250 Hybrid model made it happen to users who enjoy manual and electric functions as well. As the beautiful name suggests, it packs two function modes into a compact sharpener with a budget price everyone can afford. The 3-stage sharpener will sharpen both straight and serrated knives quickly and easily. The first and second stage will electrically sharpen and hone the knife as usual while the third stage will manually refine to provide sharp, arch-shaped. The grinding material is generously coated with ultra-thin diamond abrasives to ensure the final result is a well-polished and razor-sharp knife. This consumer grade sharpener can handle almost every blade you can find in your kitchen. To demonstrate its competency, it can also sharpen sports, hunting, pocket and butcher knives too. Do note it only handles 20 degrees class knives. Compare other brands with almost the same price, Chef’s Choice 250 tops the list when it comes to performance to price ratio. Do not judge the exterior that is made of plastic, it serves more than what you can expect. 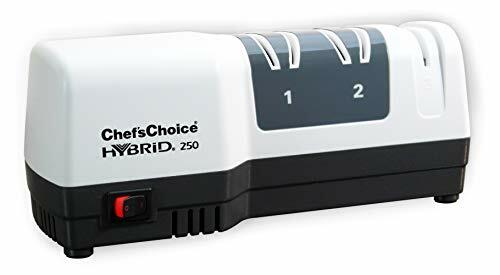 Read full review on Chef’s Choice 250 Hybrid Knife Sharpener. The combined features of electric and manual sharpening with 100% diamond abrasives make an excellent choice for many people. It is also very affordable for what Chef’s Choice provides in this model. 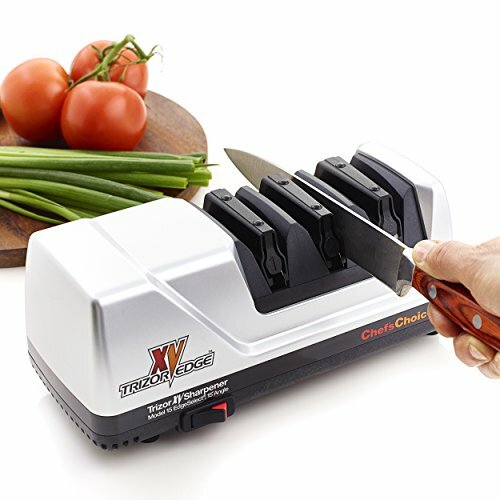 The Chef’s Choice 15 Trizor XV is a unique 3-stage electric knife sharpener. Unlike other similar models, its mission is to convert any knife to a 15 degrees angle blade. If you have American and European knives thinking to convert it to 15 degrees class knives, you’ll appreciate the Chef’s Choice 15 Trizor XV EdgeSelect sharpener. The conversion is rather unique by which it imposes a 3-step bevel grinding using 100% diamond abrasive disks. The first stage features a sharpening port and the second stage is used for honing. The third stage features a flexible diamond abrasive disk for stropping or polishing the knife. The combined stages grind the knife to approximately 25 degrees, followed by 22 and lastly 15 degrees. To ensure it’ll stay sharp and last a longer time than the traditional Asian knives. A 15 degrees knife tends to cut more easily than a 20 degrees angle edge knife. It also works well with serrated blades. This model is built to a high standard with a 3-year warranty and produces accurate results every time. Within minutes you can have a sharp and polished knife to boost kitchen efficiency. Although it’s a well-built sharpener and easy to operate, beginners may take some practices to get the hang of it. Read full review on Chef’s Choice 15 Trizor XV EdgeSelect sharpener. Convert a 20 degrees blade to a 15 degrees angle sharper knife. This is the ideal choice for those who want to convert standard European knives to 15 degrees Asian knives. The 3-step bevel sharpening process will optimize blades to last longer than standard 15 degrees knives. If you’re familiar with Presto sharpener, you can easily spot the Presto 08810 is a step up of the previous 08800 model. Yes, it’s still a budget knife sharpener and this time it features a 3-stage instead of the previous 2-stage model. And the efficiency of the Sapphirite sharpening wheels makes it a worthwhile buy. We’re glad that the Presto 08810 professional electric knife sharpener is nothing short of brilliant with the unique feature of interchangeable blade guides switch. This feature allows users to sharpen a variety of blades with different thickness. In stage 2, simply adjust the blade selector for thick, medium or thin knives setting according to the thickness of the blade. The automatic blade angle adjuster will optimize the cutting to get the best results. This feature is called ‘No Guess Sharpening’, only from Presto 08810. This model can handle mostly European knives but it’s a challenge to sharpen Japanese knives because of the higher bevel angle it imparts on blades. It’s also not recommended to sharpen smaller and paring knives. While it has some limitations, the Presto 08810 can deliver a razor-sharp edge on most kitchen knives. The third stage or the honing stage is optimized to deliver such hair-splitting sharpness. To prevent wobbling while sharpening, five suction cups on the bottom firmly hold the unit in place ensuring consistency result every time. And metal filings are collect in the red receptacles underneath for easy disposal. Overall, the 08810 has added more useful features while it retains the sleek and modern look of the 08800. It is an affordable and versatile 3-stage sharpener with decent quality. The interchangeable blade guides and Sapphirite sharpening wheels make an excellent choice for budget-conscious buyers. 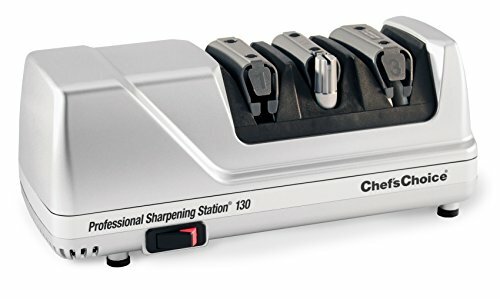 The Chef’s Choice 130 features a 3-stage sharpener with an extra word “professional” added to distinguish it from other models. Many users agreed that it makes a difference when it comes to sharpening kitchen knives, hunting, pocket and utility knives. The first stage is a 100% diamond abrasive that turns dull knives really sharp in seconds. While this professional sharpening station actually produces the sharpness better than a new knife, it also uses the super-hardened miniature steel in stage 2 to create the microscopic serrations on the blade. This unique feature will create the extra bite when cutting food to prevent it from sliding. It is mostly found in professionally steeled edges but it’s included in Chef’s Choice 130. The third stage is also a 100% diamond abrasive flexible stropping disc to polish the blade to hair-splitting sharpness. Like many other sharpeners, serrated blades can also be sharpened in the final stage. With a 20 degrees angle designed to handle mostly American and European knives, you may not want to sharpen a Japanese knife and damage it. It can sharpen any type of knife blade for as long as you know how to use it effectively. The angle guides will ensure foolproof sharpening every time. The Chef’s Choice 130 is a sturdy machine made from polymer. The stabilizing feet ensure stability and consistent sharpening results on all types of knives. This model is reliable without compromising on quality and it’s strongly recommended for beginners as well as experienced users. Chef’s Choice 130 sharpener is backed by a 3-year warranty and the results match the professional sharpening services out there. Did you know it’ll cost $5 to $10 to sharpen a knife if you send to a knife sharpener service center? If you have a bunch of knives, the one-off price is worth many times the investment in the long run. This would be a great investment with the high quality built-in features to handle American and European knives. 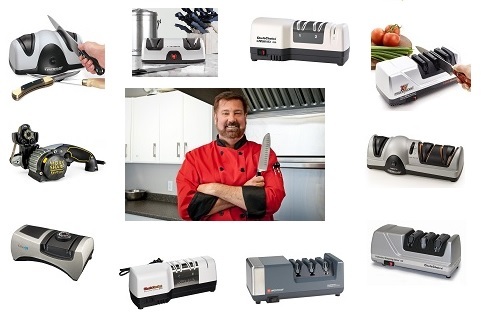 Chef’s Choice has partnered with Wusthof to produce the PEtec 2933 electric knife sharpener. 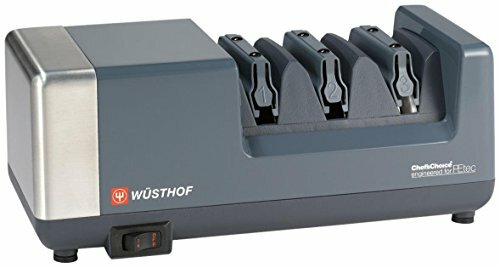 For those who haven’t heard of Wusthof, it is a German company founded in 1814 specializing in making high quality kitchen appliances, including knives. So what’s so great about Wusthof PEtec 2933? This 3-stage sharpener has no distinct difference from other similar chef’s choice models other than it sharpens blades down to 14 degrees edge. This is quite similar to the Chef’s Choice 15 Trizor XV. Wusthof uses a new sharpening technique known as PEtec (Precision Edge Technology) for making knives. It combines laser-guided system with computer-aided software to deliver knives with super sharp edge before leaving factory. What does PEtec have to do with this sharpener? To be honest, we couldn’t find any relationship closely related to it. This sharpener does not come with laser-guided system and software to function. It’s a standalone unit. We believe it’s just a marketing strategy. But one thing for sure is the 100% diamond abrasive wheels will definitely reshape and polish knives at its finest, ensuring exceptional sharpness. Dull blades can be quickly reshaped to lease a new life in stage 1. You’ll have to know the types of knives you want to sharpen. For this thin angle, you’ll properly know that Japanese and Wusthof kitchen knives are well suited for this sharpener. Unless you intend to re-profile the American and European knives which have thicker blades, this is something to be aware of. Stage 2 is a finer stage for honing and smoothen the blade after stage 1. It does not remove much of the steel as opposed to stage 1. And for normal sharpening, you can start with stage 2. You can get sharp blades with the fine grit diamond wheel in this stage. The third and final stage always ensures exceptionally sharp and polished blade with the ultra-fine stropping discs. After passing through the three stages, knives are as sharp as new if not better. The Wusthof 2933 electric sharpener weighs approximately five pounds which are considered light. You can store it away conveniently with measurement of 10 x 6 x 6 inches. And the powerful motor works consistently without a sign of slowing down. That’s means it’s close to a mini size with a big performing sharpener. The non-slip rubber feet at the bottom prevent slipping and sliding during operation. That ensures stability and translates to precision gliding throughout the 3 stages when you pull the knives. The diamond abrasive wheels incorporated with 14 degrees thin angle sharpening system deliver hair-splitting sharpness. For those who have a bunch of dull knives to re-profile to a new edge, the Wusthof 2933 is a quality sharpener worth buying. After having examined numerous 3-stage electric sharpeners, we’re impressed with the performance of the Chef’s Choice 270 Hybrid Hone Knife Sharpener. The Chef’s Choice 270 is yet another innovative sharpening machine with the unique CrissCoss technology that is loved by professional chefs and home cooks alike. Basically, it creates the microscopic “teeth” along the cutting edge that helps to cut food effortlessly with the strong “bite”. 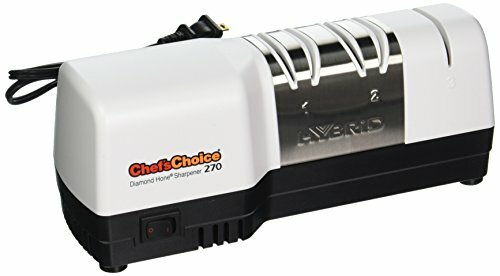 The Chef’s Choice 270 is a hybrid sharpener that is capable of both manual and electric sharpening. It sharpens kitchen knives, sports and pocket knives with the standard 20 degrees angle edge. The 100% diamond abrasives will turn dull to razor-sharp knives in minutes. Stage 1 and 2 are used to sharpen knives electrically while the final stage is used to polish knives manually. The third stage is also used to sharpen serrated knives. Weighing merely 2.35 lbs, this sharpener is amazingly light. That goes with the dimensions of 9.125 x 3.75 x 3.125 inches. Do you have a small kitchen countertop or storage room? No worries. This compact size sharpener guarantees you can easily find a place for it. While it’s an affordable hybrid sharpener, it was built with quality and durability in mind. Chef’s Choice stands by the 1 year warranty and as long as you use it properly, it can last for many years. If you enjoy using both electric and manual sharpening method, you’ll find Chef’s Choice 270 is a good buy. Moreover, the CrissCross technology guarantees cutting food a breeze. The manual honing in stage 3 operates quietly. It’ll not wake up your partner in the wee hours while using it. One of the versatile electric sharpeners by Smith’s is the KitchenIQ 50353. The reason we packed it in the top 10 list is the built quality and Angle Adjust selection to cater to a wide variety of knives. Gone are the days we’ve different brands of knives and having trouble to keep all the edges well maintained. 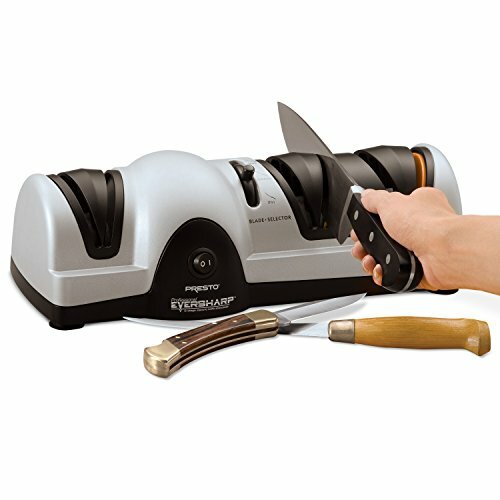 The Kitchen 50353 is the all-in-one electric knife sharpener that can restore Asian and European cutlery knives to factory sharpness or even sharper. In fact, there are not many sharpeners on the market that can sharpen a wide variety of different angle blades. The KitchenIQ 50353 is one of them and it sharpens all knives effortlessly from 10 to 30 degrees. And this sharpener is user-friendly and easy to operate. Beginners are guided by the marking of common angles for European or Asian styles cutlery on the selection knob. Once the correct sharpening angle is set, any knife can restore its sharpness in no time. 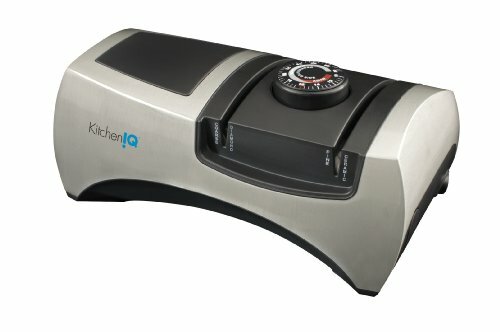 The KitchenIQ 50353 features a 2-stage electric knife sharpener with interlocking diamond wheels in the first stage and interlocking ceramic wheels in the second stage. The interlocking wheels sharpen both sides of the knife simultaneously thereby eliminating the need to sharpen either side of the knife one at a time. Coarse sharpening is done in stage 1 in just a minute. And 10 to 15 seconds is enough to polish a knife in stage 2. The sharpener also includes a manual sharpening slot for serrated knives. This sharpener can handle chef knife, Santoku knife, paring knife, utility knife, boning knife, scissors and serrated knives. It is still a compact unit measuring 10.5 x 8 x 4.6 inches. And the 6.2 pounds KitchenIQ sharpener does not weight heavy too. The modern and sleek design blends well with any kitchen top. Add it to your kitchen asset and you’ll sharp knives for years to come. It is not surprising the KitchenIQ sharpener comes with a generous 3-year warranty based on the superior design and quality. The versatility to sharpen all kinds of knives makes it an excellent choice. The high-quality diamond and ceramic wheels deliver the sharpest edges we considered they’re the best combination in electric knife sharpener. The Work Sharp Ken Onion is a must have if you want an all-in-one knife sharpener that can deliver amazing results. It features a belt grinder with adjustable angles between 15 to 30 degrees (with 1 degree increment) enough to turn any blade to hair-splitting sharpness in minutes. The sharpening guide also proves to be useful for beginners. Depending on your confidence level, you can either use the sharpening guide or remove it for freehand jobs. The unique feature of variable speed motor adjustment provides even more control right down to smaller detail work. Experienced users will enjoy this advanced feature to control the heat of the steel temper while sharpening. But this handheld sharpener is also great for beginners too. Before using this sharpener, spend some time reading the user’s guide to get familiar with the operation. The best results usually come from good operating skills. The five different abrasive belts come in handy from coarse to medium to extra fine sharpening. And it takes only 20 seconds to change it from reshaping to polishing a knife. Another benefit is the convex edge. Using the Ken Onion belt system will develop a convex edge on the blade. This results in less friction during cutting as compared to the typical flat grind. And it’s more durable due to more supportive steel behind the edge. The versatility of this all-in-one knife and tool sharpener can sharpen any kind of blade. Be it kitchen, hunting, filet, tactical, outdoor, serrated, and pocket knives. Or the larger blades like kukris, tomahawks, and machetes. You can even sharpen ceramic blades with the optional diamond belts. In fact, it can actually do much more. By removing the sharpening guide, it can be converted to a sand grinder for sharpening axes, lawnmower, and other tools. For the advanced users, do consider the upgrade options of Tool Grinding and Blade Grinding attachment to expand the sharpening capabilities. Read full review on Work Sharp Ken Onion Edition. The versatile and flexibility with optional attachment are the selling points of this Ken Onion Sharpener. There are many features pack into this compact handheld device makes you feel like you’re having a professional sharpening machine at home. Why Choose an Electric Knife Sharpener? If you use expensive knives or have a high budget, it’s definitely worth investing in an electric knife sharpener. Many people prefer to use the electric models due to their flexibility, speed, ease, and comfort that it provides. Choosing the best electric knife sharpener is simple if you have done your homework right. Firstly, know the types of knives and bevel edges you need to sharpen. If you’ve American or European style knives with a bevel angle of 20 degrees or more, you should look for a knife sharpener suitable for that. Japanese style knives are 15 degrees with the harder steel blade. Use it on the sharpener with 20 degrees angle will damage the knife. So the first thing is to check your knives first before getting an electric knife sharpener. Matching the correct angle guide of the sharpener to the knife bevel is the first step to choosing an electric sharpener. This will ensure you’ll get a great machine that will surely restore dull knives to crisp and razor sharp. Some models have a variable angle to adjust for different types of knives. These are some sharpeners that are worth investing in the long run. From Japanese Sushi knife to Wusthof Chef’s knife to hunting knife, all sharpened by one sharpener. The Work Sharp Knife Sharpener is worth considering in this case. The professional chefs and veteran cooks loved this feature as they tend to sharpen many types of knives very often. What is The Best Kitchen Knife Sharpener? This is a common question. But there is no definite answer. As a matter of fact, there is no single knife sharpener that can accomplish everything flawlessly. Choose only what’s suitable for you based on the criteria that you set. This depends on your own unique requirements. Below are some guides that can help you to make a better buying decision. To most buyers, this is the key factor in deciding a purchase. The prices of electric sharpeners range from 20 something to more than 100 dollars or more. As a general rule, if you rarely cook and not particularly important about sharpening quality, then a cheap model is what you need. On the other hand, if you loved to cook and always want to impress yourself and others with a razor sharp knife. It’s always worth to get a mid to high-range sharpener to ensure sharpening quality. Nowadays, electric sharpeners keep improving to gain trust from consumers and market share. Manufacturers like Chef’s Choice and Work Sharp are the leading brands on the market. So rest assured you’re getting the best investment for years to come. In general, reliable products always come from trusted manufacturers. If you compared different brands, size does vary from one to another. It is appealing to buy the most compact size with the most features built-in. This will save space on your countertop. And when it comes to color, most knife sharpeners are either black, white or in stainless steel finish. It’s usually not an issue to blend well with kitchen countertop. Reputed manufacturers have done enough surveys in terms of style and design to know what consumers want. During the sharpening process, you’ll need one hand to hold the unit and another hand to pull the blade. Some models have a soft rubber grip on one side to ensure you can hold it firmly and some have rubber suction cups on the bottom to prevent sliding. Are all these factors important to decide a buying decision? Why not take a few minutes and make a comparison? Diamonds are one of the hardest minerals on earth and a great choice for a knife sharpener. Most of the electric knife sharpeners nowadays are equipped with diamond abrasives. 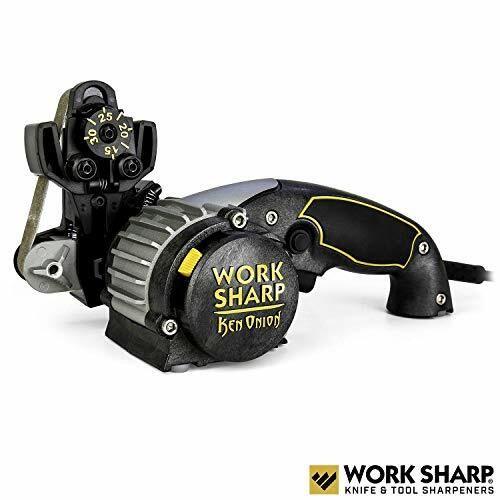 If you want a sharpener to give you the best sharpening results, then you should look for a knife sharpener that is equipped with 100% diamond abrasives. Ceramic abrasive is another hardest material besides diamonds to perfectly horn the knife razor sharp. There are some models that come with 100% diamond abrasives and some combined diamonds with ceramic abrasives. Tungsten Carbide and Steel are other types of grinding materials that are also popular in sharpeners. Take your time to review the best sharpening abrasives according to your budget and needs. Most sharpeners come with at least 2 or 3 sharpening stages, also known as knife blade slot. For a 2-stage sharpener, stage 1 is for repairing the knife which means more metal will be removed from this stage. And the second or the last stage is to polish and horn the knife. It gives a final touch to the knife and makes it looks brand new! The polishing stage also removes all of the excess metal shards from the knife, making sure that you do not end up mixing pieces of metal while cutting up the food. For a 3-stage sharpener, there is an additional stage in the middle. It serves as a medium polishing stage before the final stage so you’ll get razor sharp blade better than the 2-stage sharpener. Although both 2 and 3-stage sharpeners can sharpen serrated knives, it’s advisable to invest in a 3-stage sharpener. The additional stage to polish knives to hair-splitting sharpness will bring back its glory in one to two minutes. Which to Choose – 2 or 3-Stage Sharpener? Now the question is do you need a 3-stage sharpener to get the job done? It depends on the usage and the types of knives you have. If you’ve cheap knives and only cook once a while, then we’ll recommend a 2-stage sharpener. Other than that, it’s advisable to buy the 3-stage sharpener to ensure sharpening quality every time. You may come across some models that only have one stage (sorry, not included in this review). That means it only has the coarse sharpening stage and nothing more. We do not recommend it as you’ll get a badly-sharpened knife that feels rough and blunt as compared to other sharpeners. And do not try serrated knives on it as it’ll damage the serration beyond repair. Do you want the sharpener to work on any type of edge other than just kitchen knives? Think about axes, lawnmowers, scissors, gardening and other woodworking tools. In our humble recommendations, the Work Sharp Ken Onion is a perfect choice for heavy duty sharpening. It also has attachment options to further expand its sharpening capabilities. The ease of cleaning is another factor to consider when buying an electric knife sharpener. When you sharpen a knife it leaves behind metal residue and it’s also important that it should be easy to dispose of. Most of the models have high-grade receptacles to collect the metal filings and disposing of it does not take much effort. It’ll take less than 1 minute to clear the residue. In fact, electric sharpeners are quite easy to maintain. As it’s made up of high-grade plastic or stainless steel body, cleaning with a damp cloth is all that you need to make it shines. It requires no maintenance as long as you do not abuse it (running non-stop). The warranty period does reflect the sturdiness and reliability of the sharpener. Most of the models come with standard 1 year warranty while some will extend to 2 to 3 years. If everything (specifications and features) are being equal, getting a sharpener with a 3-year warranty is definitely worth the purchase. Using an electric knife sharpener is no big deal and with practice, you can easily learn how to do it. Most electric knife sharpening machines are equipped with a user manual with clear instructions. You should, however, be careful if you are using it for the first time and make sure the safety precautions are followed so that you do not end up hurting yourself or those around you. You should know the shape and style of the blade so that you are able to put it in right. The better you know the shape of your knife, the better you would be able to sharpen it. Flat knives are easier to sharpen than curved ones. Understand how your electric knife sharpener works. Read the manual which accompanies the machine. All sharpeners work differently, so you should be aware of how yours works. Even if you have used electric knife sharpeners before, it is still advisable to read the user manual for the new machine. You can now proceed to start using your machine. Plug it in and turn the power on. Make sure it is placed on a flat, dry surface. You should know how much sharpening do your kitchen knives require and which stage of sharpening they require. Most of the electric knife sharpeners start with a coarse stage for dull blades, then a finer stage for blades that are not too sharp or too dull, and then finally, a third stage for polishing. Put the knife into the slot. Make sure you’re holding the knife down firmly but do not apply pressure. Let the weight of the knife sit in and have contact with the abrasives. Now draw the knife slowly and consistently towards you. Make sure you run through the heel all the way to the tip of the knife. You need to repeat this process twice on each side, which means a total of four times. Repeat this step on either second and third stage to further hone and polish the knife. Switch off the power after complete the whole sharpening process to prevent the motor from heating up. Now check whether you have achieved your desired sharpness. Keep a tomato handy to check how sharp the knife is. If you’re not satisfied with the performance, repeat the same process again untill you feel you have achieved the desired results. Once you are satisfied, clean your knife with water and towel dry. Generally, electric knife sharpeners are quite safe, simple to use and convenient. There are, however, certain safety tips that you should keep in mind. Always read the user’s guide or the manual. Make sure you understand fully what the machine is all about and how to use it. Understand whether any preparations need to be done before using, and how to clean it up after you are done. Some people simply ignore this, but it is quite important. Every model operates differently. And even if you have been using electric knife sharpeners before, you should still read the manual every time you buy a new machine or another model. It’s not surprising you can pick up some tips from the user’s guide to maximize the performance of the operation. Never use electric knife sharpeners with water or any or any other lubricants or place it in any liquid. Make sure there is no water around while you are using the device. Never use an electric knife sharpener that has a damaged plug or a damaged cord and do not try to fix it with electrical tape since it can be very dangerous. Make sure you do not use the device near or around children and make sure it is out of their reach. Always switch off the machine and take the plug off when you’re finished. If the machine is meant for household purposes and cutlery, do not use it on other knives. Make sure there are no hot surfaces around, and the power cord is not tangled. As long as you follow these steps and make sure you’re doing what the instruction manual says, then you can use it safely and it would last for years! Thank you for reading this far! We hope this guide will educate you on everything you need to know about electric knife sharpener. Once you have read this guide, buying the best electric knife sharpener will be a piece of cake for you!